Groundwork Rhode Island (RI) is a non-profit organization working with residents to create healthier and more resilient urban communities through physical improvements and stewardship that help the environment and create economic opportunity in high-poverty areas. Creating connections and partnerships with residents, businesses, government, and other organizations, Groundwork RI offers many programs, including: Green Team summer youth employment, adult environmental job training, Hope Tree Nursery, Ring Street Community Garden, Prairie Avenue Greenhouse, Harvest Cycle residential compost pickup service, and the GroundCorp landscaping social venture. 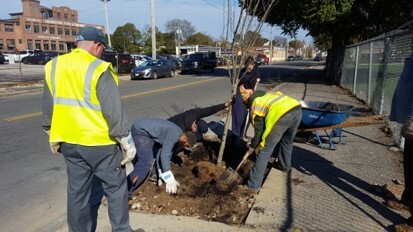 Groundwork RI is also an active member of the RI Green Infrastructure Coalition – an alliance of nearly 40 members of businesses, organizations, and government offices – that encourages the implementation of green infrastructure projects statewide. As a part of the Urban Flooding and Equity for Vulnerable Communities Collaborative, Groundwork RI worked with the Woonasquatucket River Watershed Council to promote equity by (1) implementing green infrastructure projects in underserved communities vulnerable to climate change impacts, and providing residents training and workforce development, and (2) bringing the awareness of equity to the Green Infrastructure Coalition through workshops and partnerships.